More and more often these days, we seem to be getting commissions to design and build screen porches. A screened porch is a wonderful way to expand the living space of your home, offering a protected outdoor space that in the MD, DC, VA climate can be enjoyed almost year round. 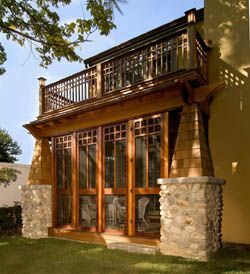 Beams and columns are crucial elements to a well-built screen porch. With applied trims and moldings, these structural elements become an architectural feature establishing a rhythm and vocabulary for the porch. Weather resistance is another key feature to any well-built screen porch, but it should not come at the expense of style. Careful detailing of exterior grade woods, composites and masonry can create a fit and finish equal to that of any interior space. The same philosophy should be applied when selecting lighting and furnishings for the screen porch. Instead of field-stretching screens, we prefer to install custom screen panels built of decay-resistant Spanish cedar or mahogany. Each panel has removable screens for easy cleaning and maintenance and can be substituted with tempered glass inserts that extend the utility of the porch into the fall and winter months. 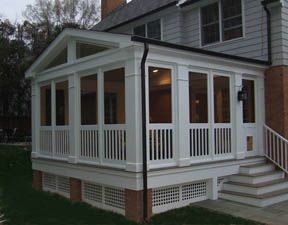 To us (and our clients), a screen porch is more than fiberglass screens stretched across the framework of wood supports, it is an extension of the home; refined to the same level of detail and sophistication as any other room in the house.